It’s kumquat season! If your tree is going bonkers, or you have access to fresh kumquats, you may be wondering what to do with these unique fruits. I’ve been using kumquats in various recipes, but this is my favorite. You only need kumquats, sugar, and water to make this fresh marmalade. 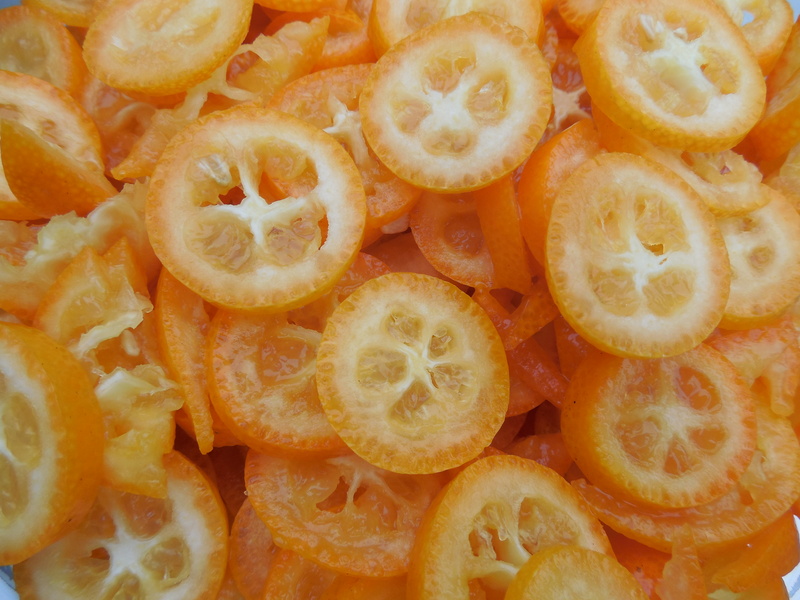 Slice kumquats crosswise to make 5 cups, removing the seeds as much as you can. This is the tedious part. You will go through various emotional stages as you slice the small kumquats. Cup 1: Oh, how pretty! Cup 2: This isn’t so bad. Cup 3: Wow, it really took a long time to just slice that last one cup. Cup 4: This is ridiculous. Who is even going to care that they are sliced in rounds? Cup 5: Yay! I’m done! I am never going to so this again. Next time I’m just going to chunk them in a blender. Chunking them is totally acceptable, but I do like how the slices turned out. Boil with 6 cups of water for 5 minutes. This is a good time to skim off any seeds you missed. Let cool, then set in fridge overnight. Mix in 4 cups of sugar. Cook over high heat, stirring constantly, until it reaches 220°F or passes the gel test. Ladle into prepared jars, leaving 1/4 inch headspace. Can pints or half pints in boiling water bath for 10 minutes. I was concerned that just using kumquats wouldn’t give me enough jelly between the rind pieces, but it turned out that there is plenty of sparkling jelly. I love the look of the thin strips of rind and the few circles that were left after the cooking process. If you prefer more bites of peel per bite, you may want to process some of the kumquats. For other two ingredient jams, check out my post on strawberry jam (my husband’s favorite! 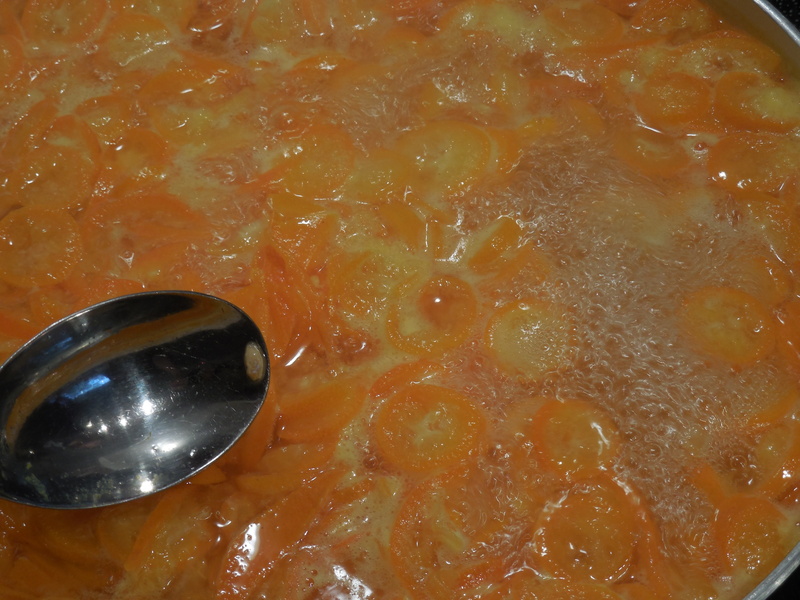 ), and peach jam. 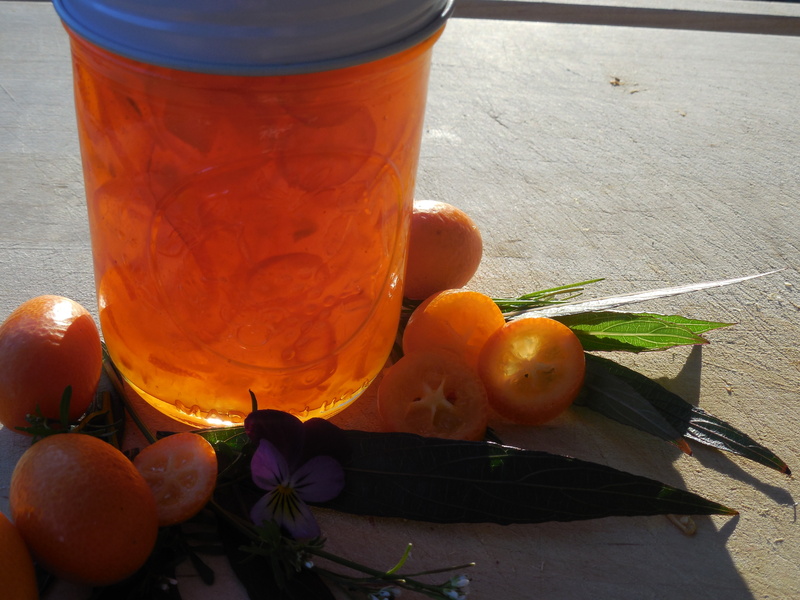 Look for my Strawberry Kumquat Marmalade recipe soon! Ha! The funny thing is that my initial reaction to that first photo is perfectly aligned with your sentiment on the first cup. I’m sure it would get tedious as the fruits piled up, but I have no doubt the work would be worth it in the end. That sounds delicious! I wish I could’ve captured how pretty it looks with the sun shining behind it. I like how the slivers and rounds look suspended in the clear jelly. Very nice Sarah. Great blog by the way!